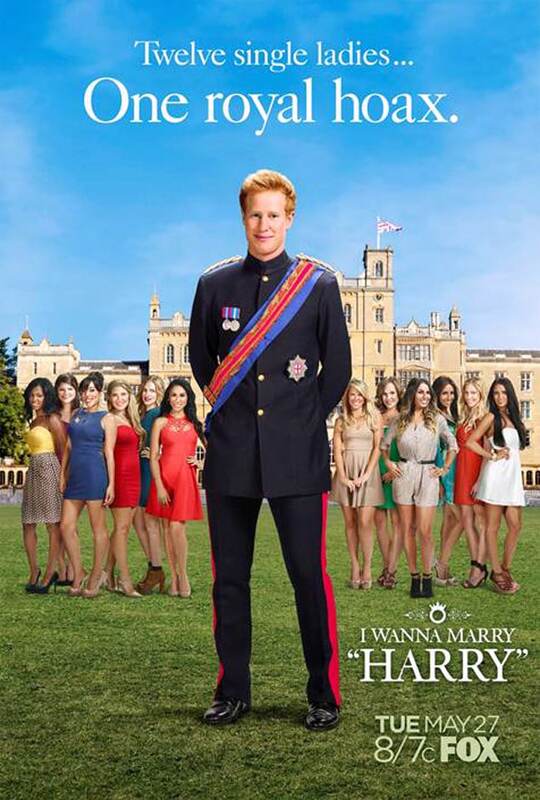 “I Wanna Marry Harry” is screened on the American TV network Fox and involves a Prince Harry lookalike and twelve American girls who have been flown to a British castle to compete for his affection. The first thing that comes to mind is the obvious question – do the girls seriously believe it’s the real Prince Harry? Surely not? Well, I suppose he is a redhead with a British accent and fancy clothing – close enough. Of all the men in the world seeking help to find their future wife (with the help of a no holds barred American reality TV show), why wouldn’t it be a member of the British royal family? If you’re wondering how it’s possible to dupe the contestants to apply for a show like this (and believe it), the producers were very clever about this. They never actually told the girls they would be competing to date Prince Harry, instead, they set up some elaborate stunts so the girls speculated about the mystery man’s identity and came up with the Prince Harry idea themselves. Stage 1:Find a British Prince Harry lookalike (Matt Hicks, environmental consultant and part time Prince Harry lookalike from Exeter). Stage 2:Dye fake Harry’s naturally blonde locks red for the show. Stage 3:Dress fake Harry in an outfit Prince Harry would usually wear (khaki trousers, blue shirt). Stage 4:Give fake Harry etiquette classes (table manners, royal sports and general Prince Harry knowledge). Stage 5:Send twelve attractive American girls to a regal British castle for the arrival of… ‘the mystery man’. Stage 6:Place a butler and servants around the property with white gloves…fit for royalty? Stage 7:Place security guards around the property with dark sunglasses and ear pieces. Stage 8:Stage an entrance that involves a helicopter landing and being whisked away in a fancy car – making them think it must be someone important. Stage 9:Make the introduction even more mysterious by setting up a masquerade ball for the girls and fake Harry. Stage 10:Let the games commence! In Episode one, we see Matt Hicks going to ‘Harry School’ where he has a comical crash course in some of the sports associated with British aristocracy, such as fencing, polo and shooting. He also learns table manners, ballroom dancing and all the essential Harry facts required to impersonate Britain’s most eligible bachelor. While the girls await their ‘mystery man’ in the British countryside castle, one of them comes up with the intelligent guess: “I have a feeling he’s British”. It’s a commonly used formula for a reality show – a handsome bachelor, a group of girls with model looks and the elimination of a girl each episode. The question is, will this series work or is it a tired formula? It echoes The Bachelor and Joe Millionaire and will inevitably lead to the ‘heartbreak’ of most of these girls (if anyone believes they’re in it for love not money). The show’s narrator even utters the words: “Welcome to the fairytale that could become a nightmare” before teasing us with clips from future episodes of the girls as well as fake Harry crying. The concept is pretty harsh – we’re all laughing at the gullibility of the women who believe they might be dating royalty. At the same time though, the ridiculousness of the royal scam somehow translates into compelling “so bad, it’s good” viewing and makes it a guilty pleasure! So what will keep the audience watching? Well, the fact that everyone’s dying to find out if fake Harry ‘slips up’ and makes the girls see sense and question his authenticity. People will also be curious about how he responds to the probing questions, and of course, everyone’s waiting for that last episode moment where ‘the big reveal’ occurs. Who did he pick? Will the girl still like him? Did they stay together? It’s fascinating to watch the difference between the British and American approach to dating. Matt Hicks comments about how he’s noticed the American girls don’t have ‘inside voices’ and are much louder and more confident than the British girls he usually dates. He also says how forward these girls are – before we get a teaser of future clips of him kissing several of the girls! They clearly bring him out of his shell! Admittedly it’s cruel to trick these women, but the eventual revelation that he’s ‘just a normal guy’ isn’t half as cruel the infamous British series: “There’s Something About Miriam,” where six men dated a stunning Mexican model, who waited until the season finale to reveal she was a pre-op transsexual. Matt Hicks has an undeniable gentlemanly charm and a shy, almost reluctant side that makes it impossible to dislike him even though he’s at the centre of the fakery. The show is currently only airing in America, but given the American obsession with aristocracy and the love of the British accent, I think this royal hoax could turn out to be a massive reality TV hit!